Total spectrum antiparasitic, specific for poultry. 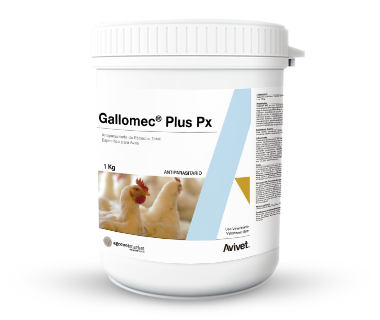 Gallomec® Plus Px is a full-spectrum antiparasitic association for its administration in food. Treatment and control of all gastrointestinal, tracheo-pulmonary and renal parasites in all stages of development. In addition to nematodes, it eliminates cestodes, controlling ectoparasites such as mites on the legs, red mite, skin mites and tail, and helps in the control of lice.